Why the mayor's race, two council contests, and several ballot measures will shape the city's future. If Measure T passes, a mostly abandoned section of Fourth Street would become an ultra-green development. On a recent weekday, Fourth Street between Bancroft and Allston ways in West Berkeley was mostly abandoned. Unlike the upscale stretch of shops and eateries on the other side of University Avenue, this section of Fourth Street, a former hub of West Berkeley's once bustling industrial and warehouse sector, is now an empty reminder of glory days gone by. Doug Herst, who owns the property on both sides of this area of Fourth, once operated a successful manufacturing business here. Peerless Lighting, his family business, designed and produced energy-efficient lighting fixtures. But faced with stiff competition from overseas companies using cheap labor, the West Berkeley Peerless Lighting manufacturing plant closed in 2006. Similar scenes, of course, have played out across the United States over the past several decades, as the nation's manufacturing base has eroded and jobs have fled overseas. West Berkeley is no different. Over the past decade or so, this area of the city has lost 1,500 jobs — jobs that, in all likelihood, are never coming back. But Herst has a vision for how to bring this bleak strip of Fourth Street back to life. He wants to turn it into a vibrant live-work community, featuring an artists' colony with fifty affordable lofts for working artists, amid about three hundred units of workforce housing. The condos and apartments would surround artisan shops and green-tech businesses, including Peerless Lighting's still-thriving research division, so that residents could walk or bicycle to work. Known as Peerless Greens, the development also would include rooftop solar panels, and both a community garden and hanging gardens for residents to grow their own food. "It's going to be a wonderful project," said Berkeley Councilman Darryl Moore, whose district includes the Peerless Greens property. "It really fits with our Climate Action Plan. It's about reducing greenhouse gases, while also bringing in jobs." Moore shares Herst's vision, as does Assemblywoman Nancy Skinner, a longtime West Berkeley resident who is one of the most progressive members of the California Legislature. The proposal is also backed by a majority of the liberal Berkeley City Council, including Mayor Tom Bates and Councilmembers Laurie Capitelli and Susan Wengraf. But Herst's plan for Fourth Street may never come to fruition unless Berkeley voters approve Measure T this November. The ballot measure not only would allow the Peerless Greens project to move forward, but it also could help revive five other similar, underused sites in West Berkeley. Skinner, Bates, and the council majority view Measure T much like the city's new downtown plan, contending that the measure would help Berkeley's struggling economy by spurring urban growth, thereby helping limit suburban sprawl and assisting the city in meeting its climate-change goals. However, Peerless Greens and Measure T are facing stiff opposition this fall from a coalition that includes a small but vocal group of West Berkeley residents who are afraid that such developments will drive up rents and property values in the area and thus displace some residents, artisans, and small businesses. 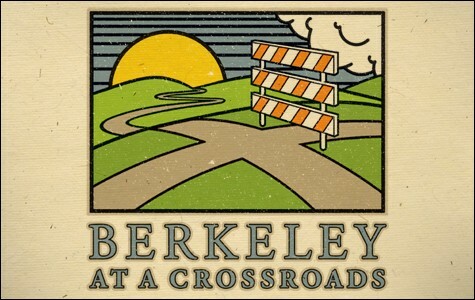 The coalition also includes longtime Berkeley anti-growth activists (who often refer to themselves as "preservationists"), plus far-left progressive city leaders — including Councilmen Kriss Worthington and Jesse Arreguín, who also often vote "no" on proposals that would increase urban density in Berkeley. Worthington also is running against Bates this fall in the city's mayor's race. And so is candidate Jacquelyn McCormick, who opposes Measure T as well and is backed by members of the city's anti-growth crowd. In fact, the positions taken by the three leading mayoral candidates, along with those staked out by candidates in two city council races, on Measure T, and measures R, U, and V, represent a striking example of the competing visions for Berkeley's future. On one side stands the pro-growth group, which includes Bates and Councilmen Moore and Capitelli, who are all running for reelection. They agree that the best way to revitalize Berkeley's economy is by repopulating the city (a concept also known as smart growth or transit-oriented development). In their view, bringing more people to town would not only provide more customers for Berkeley's restaurants, bars, shops, and small businesses, but would also produce more tax revenues, thereby helping the city avoid raising taxes on an over-taxed community and slashing more services for the needy. On the other side stands the anti-growth activists, some of who are liberals, too. They want Berkeley to remain much as it is — or, better yet, they want it to return to what it was twenty or thirty years ago, when the city's manufacturing sector was still viable. This group fears that more residents will bring traffic congestion, and they strongly oppose the direction that Bates and the council majority have been taking the city. They're also staunch backers of measures U and V, which are designed to provide what they say are vital checks on the council majority, but what Bates, Moore, and Capitelli view as attempts to stop the council majority from achieving its goals. Finally, there are the far-left progressives like Worthington who don't agree with the anti-growth activists on many issues, but tend to vote with them when it comes to questions like Measure T and Peerless Greens. "It's a watershed moment for the city," Moore said. Measure T is on the ballot because of what happened to the city's downtown plan. That plan was designed to bring thousands of new residents to downtown Berkeley, and after the council majority, led by Bates, Moore, and Capitelli, approved it in 2009, anti-growth activists teamed up with Worthington and Arreguín to "referend" it. That's a procedure in which opponents of a council decision gather signatures to put the issue on the ballot or force the council to rescind its vote. Will Pot Come Up in the Presid… Thou Shalt Not Kill? Here are the election results as of November 12 for the 2012 East Bay races that we've been following. We're also endorsing Jumoke Hinton Hodge, Rosie Torres, James Harris, and Pete Stark. Plus, we support OUSD's Measure J and Richmond's Measure N — but not Prop 33. And, oh yeah, vote Obama! Print this out and take it to the polls.